Eye examinations are generally recommended on a yearly basis or more often to monitor special eye conditions. Children should receive their first complete exam by the age of two. We are equipped with the most advanced, computerized instrumentation to provide a thorough and quick analysis of vision and to assess the health of your eye. Optometric technicians work with the doctor in performing many of these tests, along with visual acuity, color vision, depth perception, and blood pressure. 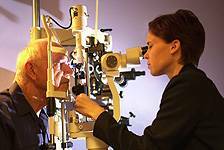 Doctors use state of the art equipment to conduct the eye exam for health and vision. To find out the answer, click here.